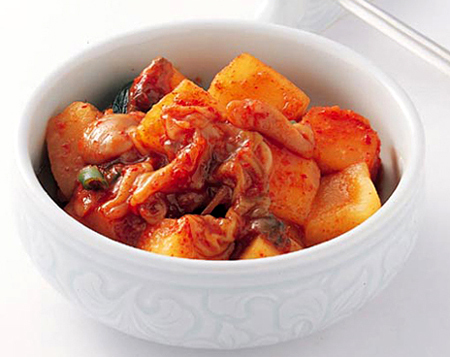 Have you eaten Kimchi,this is a Korea food,people eat rice with it.Typically radish or cabbage packed with ginger, garlic and hot peppers and then pickled, kimchi is eaten with most meals in South Korea. Now, let us learn it! First of all, Wash cabbage, cut in half, then cut half of the drain water, and then cut the carrot into filaments. And then, mix the above ingredients add salt, sugar and marinated the night mixing with water to soften cabbage, remove and drain backup. Wash the red pepper mince, garlic Peel and at the end. Lastly,Together in a bowl add shrimp sauce, chili powder and mixed marinated cabbage, and then into the bottle sealed, and then into the refrigerator, the next day you can eat .